Surprise, Ariz.-Facing their first Sooner Athletic Conference opponent of the year, the Panhandle State football team ventured 14 hours southwest to meet with the 1-1 Ottawa University-Arizona Spirit. The Aggies earned their first SAC victory (38-35) with a last-second field goal to improve to 1-2 on the season. The Spirit came into the game averaging over 50 points each in their first two contests, and coming off a 63-56 SAC loss to Langston in week two. While OUAZ was productive on offense, totaling 431 yards combined, Panhandle’s Darkside Defense held the Spirit to a season-low in total yardage and points scored. The Aggies saw improvement in the run game, posting their best rushing performance thus far; they totaled 237 yards on the ground and ran in three touchdowns, their first rushing scores of the season. With 190 yards gathered on the air assault, Panhandle put up 427 yards of total offense against OUAZ, besting both of their first two offensive outings this year. With shared duties at the QB position throughout the game, senior Brandon Ramon led off on the field for Panhandle State. Ramon went three of four in his opening drive, including a 16-yard completion to freshman receiver Emile Cola for the Aggies’ first conversion of the game. As the Aggies’ leading running back, freshman RJ Stevens started strong with a first-down carry of 27 yards that pushed Panhandle into the red zone, setting up a seven-play series that put the first points of the game on the board. Sophomore John Polston came in for Ramon and ended the Aggies’ first drive with a quarterback keeper that crossed the goal line for an Aggie TD. The Spirt answered in kind, following a 17-yard kickoff return with a 19-yard rush and two passes totaling 54 yards into the end zone. 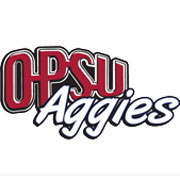 The score would not stay even for long, as a short kickoff was returned 13-yards by Cola, giving the Aggies great field position at the OPSU-45 to start their second drive. A delay of game penalty pushed Panhandle back five yards, but Polston sent a pass to junior Miquel Hudson who hauled it in for a 60-yard touchdown to give the Aggies a 14-7 lead midway through the first quarter. Panhandle’s defense honed in on the pass protection, bringing two sacks by Sequoia Smith and Diamante Pounds to help hold the Spirit scoreless through the remainder of the first quarter. The Aggies initiated a nine-play series in the second quarter that saw Polston and Ramon put together a 45-yard drive for another Aggie touchdown; Polston tucked in a four-yard keeper putting the Aggies up 21-7. Defense turned up the tackling to hold the Spirit to just 15 yards on the next possession with solid efforts by Sequoia Smith, Diamante Pounds, D’Darrin Primes and Nathan Leithead who each contributed heavily in the series. OUAZ shut down forward progress for the Aggies with a fumble for a loss of nine yards on the ensuing drive. They recovered at the OPSU-29 and went on to complete their first pass in the Aggie end zone to edge the score 21-14. Polston entered the end zone on another goal line stand with one minute left in the half; but the home team headed into Aggie territory as the clock ticked down, and narrowed the lead to seven points (28-21) going into halftime. Ottawa deferred on the coin toss and was back to receive the second half kickoff from Javier Medina. Medina booted a 64-yarder that was returned for 35 yards, landing OUAZ on their own 36 yard line to start the third quarter. Sophomore defensive lineman Braden Price boasted a big series after the break, bringing a quarterback sack for a loss of 11 yards. Price then recovered a fumble forced by Pounds on a first-and-ten play and returned it 50 yards for another Aggie TD. Senior Jawan Purifoy pulled in an interception on the ensuing drive, but the Aggie offense suffered a sack and two penalties, forcing a punt on the following possession. The Spirit struck back fast with three long passes totaling 87 yards to add another seven points to the board (35-28) with three minutes remaining in the third quarter. Panhandle State entered the fourth quarter sitting fourth-and eleven at their own 38, prompting a punt to open the final 15 minutes of the game. Both defenses were steadfast through the first seven minutes of play, allowing less than 40 yards combined over a six-series stretch. Tension mounted when the Spirit tied the game at 35-35 with 5:15 left on the clock. With a clear mission and staunch determination, the Aggies staged a very deliberate 12-play run series that set Eduardo Villarreal up for a game-winning, 20-yard field goal. The successful shot happened with just four seconds left on the clock and sent the Aggies back to Goodwell with their first SAC win under their belts. Top performers on offense included running back RJ Stevens who marked his first 100-plus yard game with 116 yards rushing. Ramon went 13-15 for 105 yards passing and Polston totaled 85 yards on five completions for one touchdown passing. Polston was the team’s second-leading rusher with 14 carries and two TDs. Receiver Miquel Hudson was second in all-purpose yards with 93 receiving and seven on the return. On the defensive side of the ball, Nathan Leithead and D’Darrin Primes led the team in tackles with eight and seven respectively. Arkivion Harris, DeQuan Charles, Sequoia Smith and Diamante Pounds each totaled five tackles with Pounds tallying two sacks and one forced fumble. The Aggies return to host their Homecoming matchup against Wayland Baptist on Saturday, Sept. 22. Kickoff is set for 2 p.m. with a full day of Homecoming activities to precede the game. Alumni registration takes place in the McKee Library at 9 a.m. with tours of campus being offered by the Aggie Ambassadors. The Homecoming Parade will roll out at 11 a.m. with a new route through campus, and a free Alumni BBQ begins in the tailgate area at Noon. The Tailgate Zone will be open for pre-game activities three hours prior to kickoff, with ten space still available on an individual game basis. Those interested in reserving a tented tailgate spot may do so online through the Ticket Roar system offered in the Fan Central tab under the Tickets link at opsuaggies.com.